Some of the news items mention individuals. This is all done with the intent of keeping people informed about where people are in a good-natured way. If you have a problem with your name being mentioned here, please let me know and I will not use it on the web site. Collage from the Seminar. In the bottom series, John Pryor in his traditional yellow/gold shirt is demonstrating how to measure the sprinkler nozzle pressure without getting (too) wet. This 2-day seminar was organised by the AGIF (Asian Golf Industry Federation) and the AGCSM (Association of Golf Course Superintendents Malaysia) and supported by the Malaysian Golf Association. 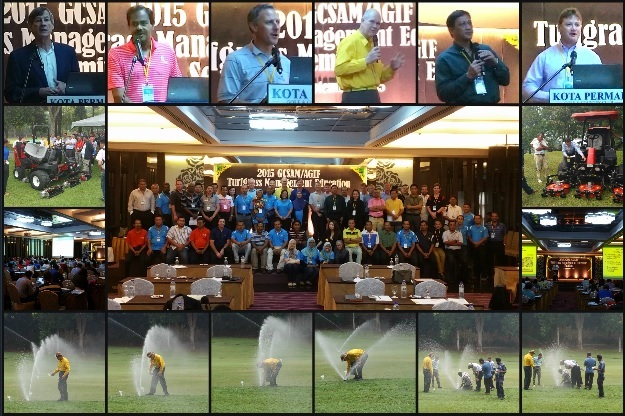 There were 80 attendees who enjoyed this well organised seminar at Kota Permai Golf Club. Thanks to Eric Lynge, PK Ong, Jack Cheong and others. I was among esteemed peers presenting my topic of Irrigation Auditing and also a field demonstration. Bob Moore (JMP Golf Design), a long-term Client of Hydrogold (since the early 1990s) presented on the hot topic of renovation. Marcus Hutup and David Lunardelli of Troon presented on their Malaysian managed golf courses and growing turf in shady conditions (respectively). Hydrogold did the irrigation designs for the Troon managed projects in Malaysia (The Golf Club at Datai Bay and Desaru Golf Courses). Denis Nuevo (Senior Manager at The Orchard Golf and Country Club in Manila) gave a detailed presentation on using green initiatives to reduce operating costs. And it was pleasing to see locals Jack Cheong and T. Puvanaendran sharing their experiences and knowledge. Hydrogold's orgins in 1987 started 28 years ago with the formation of Hydroscapes Australia Pty Ltd in 1987 with Steve Peck (www.hydroscapes.com.au). Since then, there have been many changes. In 1991 Hydroscapes Pte Ltd was established in Singapore and in 2002 Hydrogold Pty Ltd was established in Perth. In 2008 Steve left to work with Total Eden leaving the legacy to John Pryor. 2015 brings about further change. For the past 2 years, the Asian golf development market is the flatest since I have been involved with it (worse than the 1997 Asian Crisis . So, after 28 years and 280 golf courses in 26 countries, it is time for me to explore my home state (Western Australia) more. At 2,645,615 square kilometres, Western Australia is larger than all but 9 countries. And for my American friends, Texas with only 696,241 square kilometres and its 27 million people would fit neatly in our South-West . Western Australia has a population of only 2.6 million of which 1.7 million live in Perth. That leaves 2,500,000 square kilometres with only 800,0000 people. That is over 3 square kilometres per person in rural Western Australia! And it is that isolation and the unique character of the country folk that attracts me to work in the rural areas of Western Australia. So more exiting times ahead! But I will continue to do what work is available in Asia. I guess a case of having my cake and eating it too! Over the years of working in Asia, I have developed many good relationships that I enjoy and look to continue. Gives you a calendar background for your computer desktop with significant Asian region holidays and industry events.